Boy, oh boy, has it been a busy whirlwind of a month!! I'm still trying to get into the swing of work and three different schools for the kids. Sometimes it's amazing to me that I just can't seem to do it all. I know that's shocking to those of you who know me well - ha ha!! The most important thing of it all is that I try! That's what I tell my kids anyway! So, here's a card that we did at our last Stamp Club meeting. I cased the idea from a swap at our last group meeting. 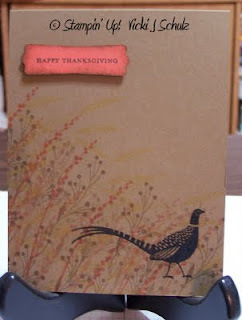 I thought it was such a beautiful card and a great use of the pheasant. He's embossed using Basic Black Craft ink and Clear Embossing Powder. I love embossing on cards because it adds such a rich texture. This card uses the Autumn Days stamp set and our In Colors - Soft Suede, Dusty Durango and Crushed Curry. Enjoy and take some time for yourself (yes, I need to take my own advice sometimes!!)... dive 'n2 stampin'! !